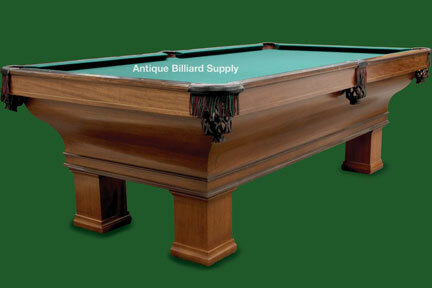 #1-10 Exceptional Brunswick antique pool table of ribbon mahogany. Elegant cabinet features compound curves and accent moldings. Early literature described this table as being "absolutely unsurpassed" in the attractiveness of the design and the quality of the construction. Eight-foot size for use where space is limited. Three-piece Vermont slate playing surface. Ready for delivery.